The third generation EZ-2 Series centrifugal evaporator from Genevac is the latest version of this popular evaporation system that combines great performance, ease of use, wide sample format compatibility and can be used with all commonly used solvents and acids. To enable users to achieve excellent results every time, the EZ-2 has been made easier to use than a conventional rotary evaporator. In addition to accommodating many more samples, it can operate entirely unattended. Using Genevac's Dri-Pure sample protection system ­ the EZ-2 can dry samples without cross-contamination and sample loss due to solvent bumping commonly experienced with rotary evaporator systems. Providing extra peace of mind with thermally sensitive samples, the EZ-2 temperature control and Auto Stop systems protect samples during operation. There is no need for special training: users just load, set and walk away. For most applications an optimised EZ-2 evaporator is available to suit various solvent removal needs. 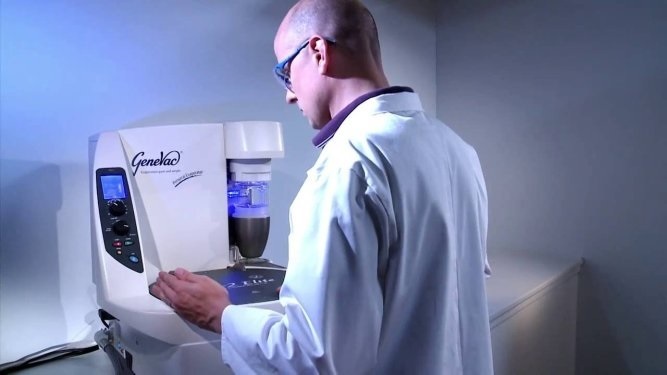 The EZ-Standard is created specifically for drying water and concentration of volatile solvents prior to analysis, the EZ-2 Plus for working with solvents with higher boiling points - up to 165°C and the EZ-2 Elite for more difficult solutions such as DMSO and NMP, or fast freeze drying. EZ-2 evaporators can be further modified for the most difficult and hazardous solvents, a special model exists for those working with potentially explosive solvents such as diethyl-ether. Alternatively, for laboratories who remove concentrated chlorinated acids and acid chlorides, a corrosion resistant construction EZ-2 HCl is a popular choice.